Iman, the 21 year-old bilateral below knee amputee, is a Syrian refugee from Hamah whose family settled five months ago in Bab el Tebbaneh in Tripoli-North Lebanon. Born with a congenital disease (Spina bifida), Iman started her journey of treatment and suffering at very young age. After a devastating infection in her legs four years ago, Iman had to undergo a bilateral amputation below the knee. Towards the end of 2013, her family arrived to Tripoli fleeing the conflict in Syria, where she lost her brother and a large number of her relatives. Iman was identified for urgent need to replace her older prostheses and was referred to the ‘Forum of Persons with Disability’ association in Tripoli. Under the World Rehabilitation Fund project, funded by UOCHA-ERF, Iman received her new artificial limbs and was trained to walk. 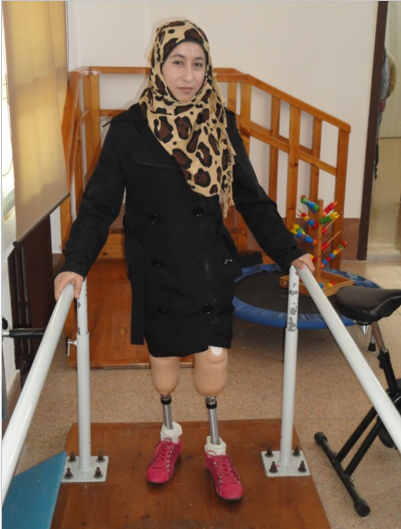 Today, Iman expresses her satisfaction and happiness with her prostheses which provided her with easy and secure movement, and relieved her back pain. She doesn’t miss the opportunity to declare her deep gratitude and thanks to the prosthetist who took care of her.